The T-Scan Analysis is a valuable tool that aids in analyzing a patient's bite and showing what is and what is not functioning properly. When a bite is unstable it can cause pain, teeth and Beverly Hills dental restorations to crack and break, gum disease, tooth loss, headaches, and TMJ Disorder. 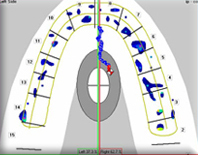 With the use of T-scan analysis, we are able to accurately measure occlusal timing and force. In the past dentists had to rely upon articulations paper, waxes, pressure indicator paste, etc., to assess and balance the patient's bite. Most of these methods are not sensitive enough to detect simultaneous contact, and none measure both biting time and force. How does T-Scan help you? By biting and chewing against the sensor, a three dimensional view of your bite is displayed on our computer screen. We can then easily adjust the bite and check our work with the sensor. The process is repeated until the biting forces are equalized. Patients can view the scans, which helps them understand what needs to be accomplished to obtain a stable bite. The T-Scan also produces documents pre and post procedure results that is critical for patient records. This process is invaluable for many treatments including cosmetic procedures.